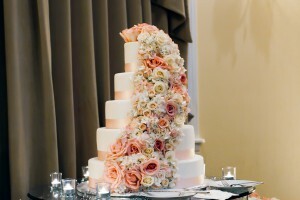 Wedding cakes are a tradition around the world symbolizing fertility and luck in many cultures. Since the Victorian era, the wedding cake has changed dramatically; no longer having to be completely white, today it may be decorated with several colors and can incorporate different themes and motifs that have special meaning for the bride and groom. Whether you choose from a photo in our huge portfolio, bring in your own pictures and ideas, or work with the pastry chef and cake designers to create a unique look, your cakes and pastries will taste fabulous and have stellar appearance. Many of our recurring clients have been our previous brides that just cannot get enough of our delicious cakes. And with over 40 flavors to choose from, who could? !